I’ve mentioned how I waver back and forth between loving and hating fearing tofu. Right now, I’m coming back from a fearing stage. That was before I tried this sandwich. Jess you’re a genius. Did I lose you? Stick with me. Please. 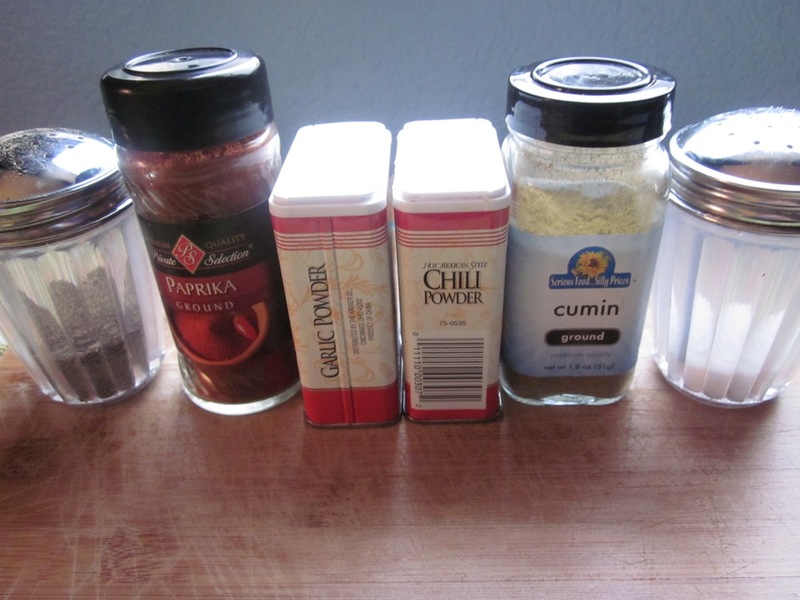 When you don’t have BBQ seasoning make your own! Yes, I do need to list those ingredients out like you can’t clearly see the labels by yourself. What would you do without me? Brush ‘fu with olive oil and coat in seasoning. This is when I stopped following the directions and opted to bake my tofu instead of pan-frying it. I’m such a rebel. 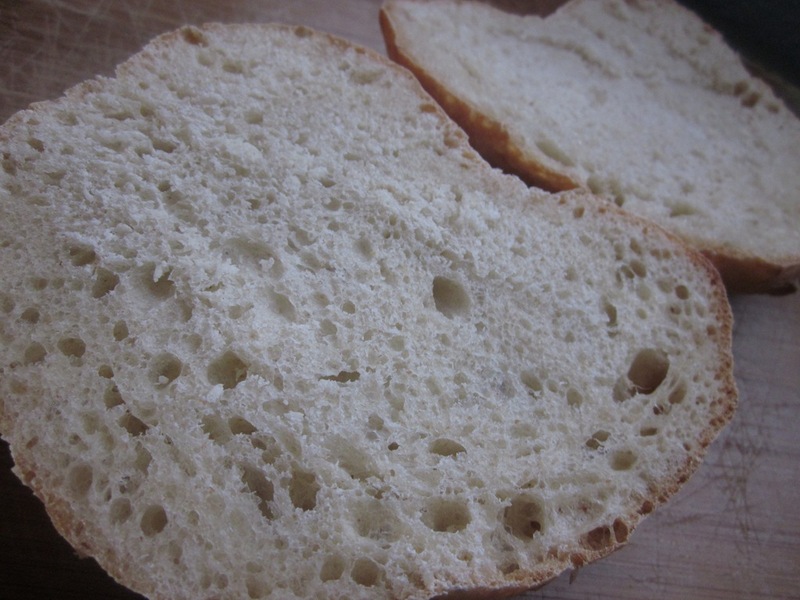 Slice open a ciabatta roll (because you purchased an entire bag full from WF on a whim) and toast in the oven. You know, while it’s already on and all. And because I was already not following directions, I might as well use cranberry blueberry jelly like Jess advised not to do. Top with baked BBQ tofu. Yeah, that part about not eating this multiple times in a week? I take that back. Are you brave enough to try this sandwich? What’s the weirdest food combo you’ve ever tried? looks delicious – and I love that you gave it a try! 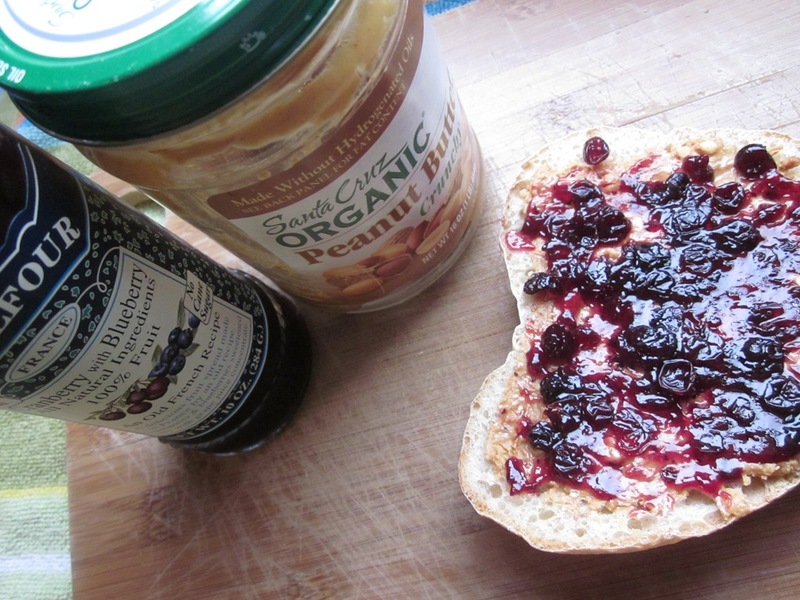 cranberry blueberry jelly actually sounds wicked good, too. It is! Except the part where it looks kind of like dark blue capers or what I imagine caviar would look like if it were blue. I have to admit, I’m a little scared of that sandwich! 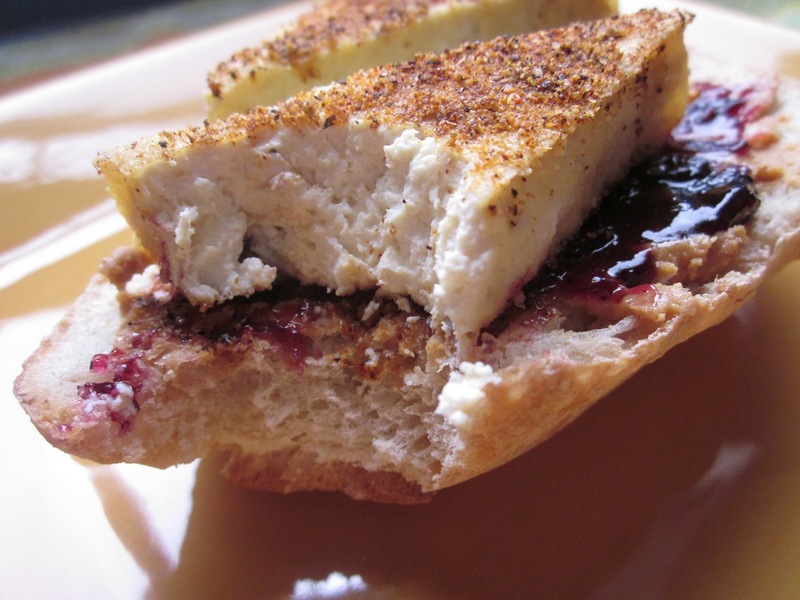 Tofu with BBQ seasoning + Pb & J is not something I would ever come up with. That being said though, I’m really intrigued and next time I have tofu on hand and feel brave enough I think I might have to try it. I am brave enough because I love PB and I love BBQ. Bring it on! What is Denver tofu like??? Ha ha I love your attitude, Shanna! I don’t really know much about Denver tofu but the taste is pretty much like any other tofu I’ve ever had. Peanut butter and pickle sandwiches are my all time favorite! This actually looks good to me..im definetly going to try it!! I love peanut butter and I love pickles but I have to be honest, I can’t imagine them together. I am very picky about my tofu.. 80% of the time I eat it, the texture is all wrong. 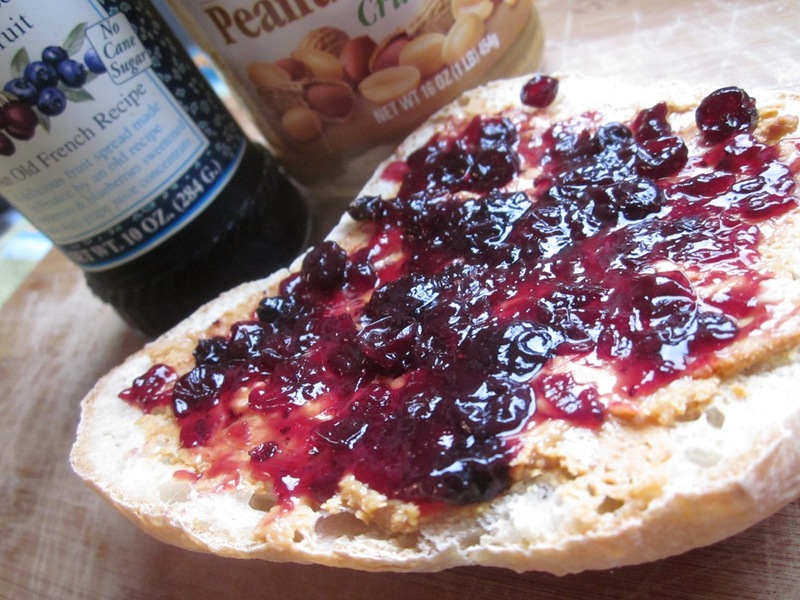 PB and J, on the other hand…. 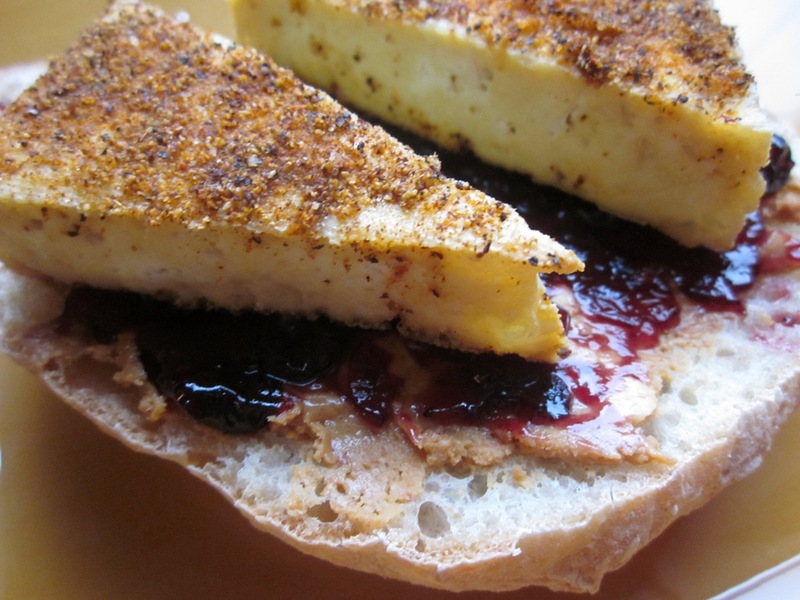 In high school I made some vegan grilled cheese sandwiches that had peanut butter in them. They were ok.. reminded me of cheap fake cheese. Yuck! 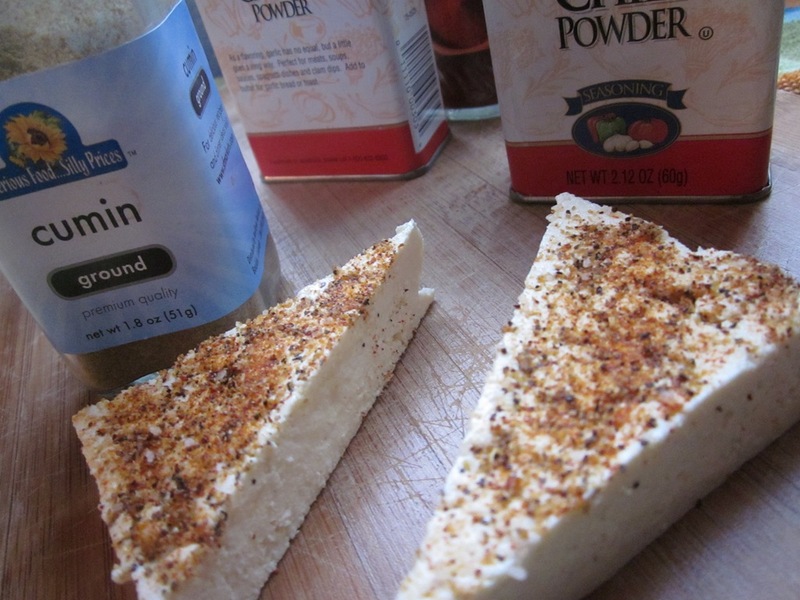 The texture of tofu is definitely something you have to get used to! And maybe sometimes you never do? Haha! The BBQ seasoning kinda throws me for a loop, but I’d be willing to try it out. I might have to start with just nut butter, jam, and tofu though… I’ve actually been curious how tofu would go in a sweeter meal. 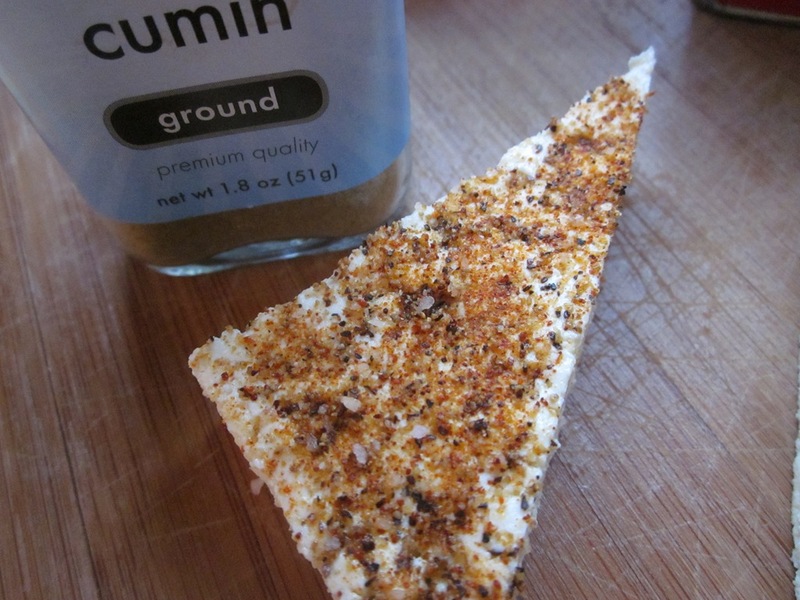 Then if I liked that, I could definitely try adding the BBQ seasoning. I’m not sure about the weirdest combo ever but just yesterday I had brown rice with applesauce and hummus… with a side of tofu mixed with broccoli and mustard. Definitely not your average combo, but oh so tasty. Haha! You’re such a rebel!! I LOVE it! I swear I ate this sandwich like 4 times in 3 days after I first tried it! Weird combos are becoming my forte…I ain’t skeered! 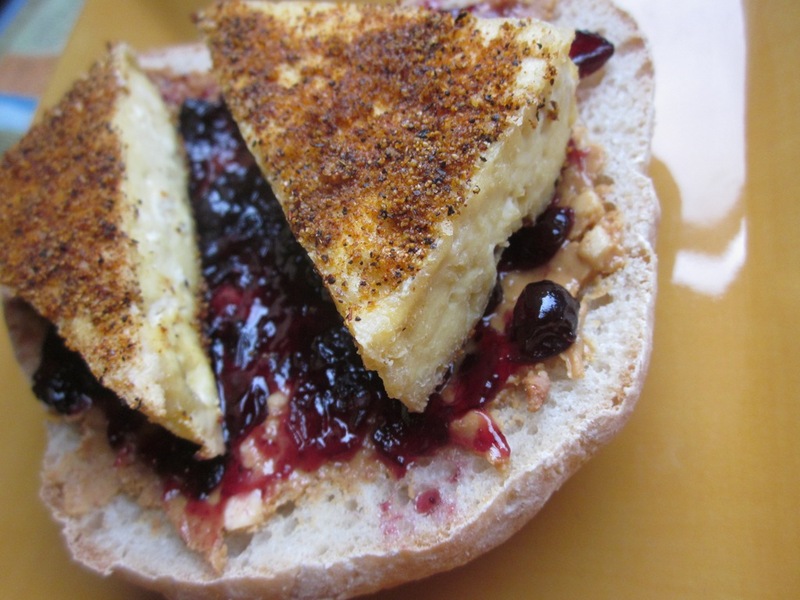 Have you tried Jess’s mustard and blueberry jam sandwich? Not regular mustard…it’s best with a horseradish/honey dijon. Sooo good! I have not, but I probably should now! !